As our pets get older, they sometimes get arthritic and can no longer get to the places they once could. Others are smaller and simply can not jump that high. Our pet ramps and steps help your dogs get to those places whether it is the sofa, your bed, or the car. The Pet Gear Travel Lite Bi-Fold Pet Ramp allows your dog easy access into your vehicle or other har.. The Pet Gear StRamp is the most innovative design in the market today. A gentle slope makes it eff.. These stylish plush pet steps provide freedom for furry friends to come and go as they please while .. The Pet Gear Tri-Fold Pet Ramp allows your dog easy access into your vehicle or other hard to reach ..
PupSTEP Wood Pet Stairs - 2 sizes! The PupSTEP Wood Stairs offer a beautiful and convenient way for pets to reach their favorite places..
Soft Step - 2 steps & available in 6 colors! Soft Step II measures 16” wide x 16” high when assembled (ships apart and snaps together) • Made of .. 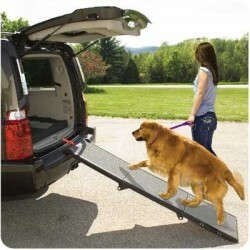 The Pet Gear Bi-Fold Pet Ramp allows your dog easy access into your vehicle or other hard to reach p..